Copart should not be looked at as a serious car buying resource for most humans. Then again, what if a car decision could be made there that’s unfathomably dumb and incredibly amazing at the same time—not to mention super cheap? 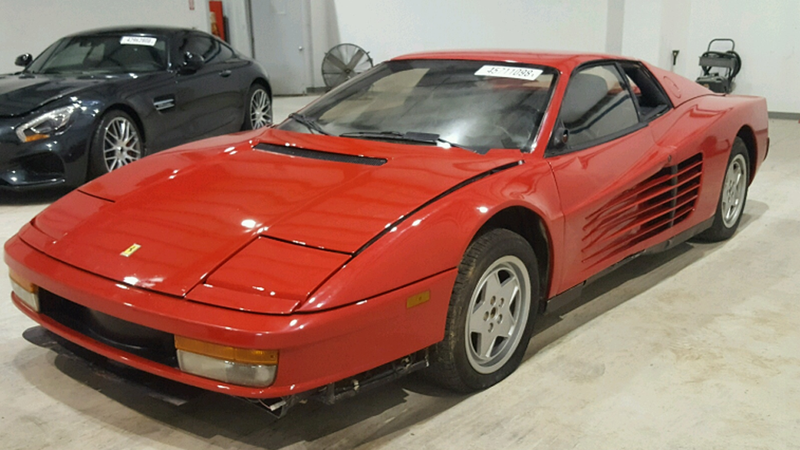 There’s a salvage-title Ferrari Testarossa there right now, and it’s sending my mind to dark places. I’ll readily admit to not being a Ferrari man. Most of the Italian brand’s cars do very little for me, personally—they’re expensive, unreliable and generally driven by monsters. But I have eyes and was born in the 1980s, so I have a deep and abiding love for the 12-cylinder Testarossa and its aggressive side strakes, pop up headlights, gated manual and swooping curves. It is a magical car, and hands down my favorite Ferrari. They’re not cheap, however. Bring a Trailer reports most of them sell for between $75,000 and $160,000 these days, depending on condition. But this ain’t Bring a Trailer. It’s goddamn Copart, where wrecked, flooded and salvage cars to go to die, overseas auctions or become the occasional Jalopnik contributor race car. Do I want to do something similar with this 1990 Testarossa? Yeah, man, maybe I do! Oh, good! ALL OVER and then UNDERCARRIAGE. Maybe the seats are nice? So clearly, this thing has been trashed. The front valence is broken and hanging off. The entire rear end is a mess. None of the panels fit together great. There’s exposed wires hanging out of the center console. And I’ve... definitely seen some better-looking Ferrari engines in my day! But you know what? This thing is currently going for just $2,350. It has five days left in the auction, but I guarantee you it won’t go for any 80 grand. This questionable heap may be the cheapest way to get into Testarossa ownership, and I think that’s wonderful and special. Any takers? I’m keeping an eye on this thing, man.